BusinessRecycling promotion partner MobileMuster, the Australian mobile phone industry's official recycling scheme, has been formally accredited by the Federal Government as Australia's first voluntary product stewardship scheme. The accreditation gives a green tick to MobileMuster, recognising both its achievements and commitment over the past 16 years. The industry has invested over $36 million in the not-for-profit program, which is free for consumers. Since the program began over 8.8 million handsets and batteries have been recycled, plus 550,000 kilos of accessories, which equates to nearly 1,100 tonnes of mobile phone and accessory e-waste. Through resource recovery and reuse, MobileMuster has reduced the need to mine 36,295 tonnes of precious metal ore, which is equivalent to keeping 2,400 cars off the road or planting 53,000 trees, while at the same time diverting tonnes of potentially harmful substances from landfill. This is the first federal government accreditation of its kind and is a major step in setting the benchmark for all other product stewardship programs in Australia. Businesses can find disposal options at BusinessRecycling.com.au. 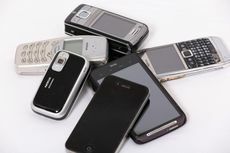 You can find your nearest drop off location for mobile phone recycling on Planet Ark's RecyclingNearYou.com.au.